I’ve seen my work posted and reposted a lot online (it probably started in earnest, with my work, when this image was the main image on the wikipedia “tattoo” entry for almost a year) and I’ve never really thought about the amount of people who may be seeing it with no idea who made it. A few things recently made me consider starting to watermark my stuff with this site’s address. First, I was looking at sketches done by some artists on a social network site I use, and found a sketch of my spider monkey mount’s skull and jaws. It was a great sketch, and I commented on it saying I loved that someone was using my work as inspiration. The artist blew it off, saying “Yes, I found this randomly online.” They had no idea they were talking to the creator of the work they were (tracing) drawing. I explained that it was my work, she was excited to find out where it came from, we made friends. It was a really good sketch. 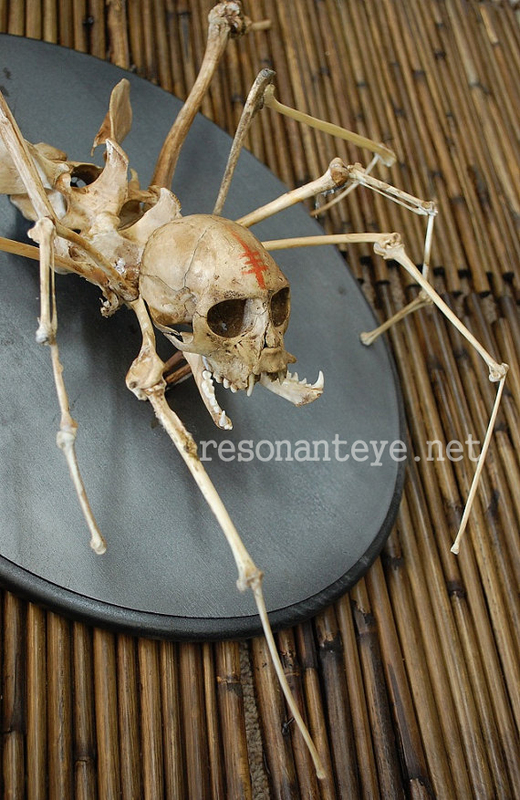 Then, I found my spider skeletons posted to a russian site- and have no idea what on earth it says, whether it links back to me (update- it does) or not, and would love to comment but have no idea which buttons are for commenting or anything since I don’t read cyrilic. Should I start watermarking things? I’d love it if every time my work was reposted or re-used, someone new came to see the rest of what I do, came here and maybe even said hi or spoke with me. Having the site address on each photo is something I have alternately been too obstinate, or too lazy, to do. I don’t think even if I did this, that I would have the patience to go back and watermark all my older images (about twenty thousand images of my various works exist online) but maybe, going forward, I should make the effort.